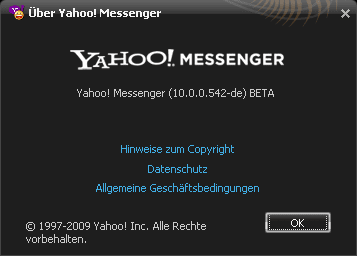 - If you were able to use your webcam on 9.0 or other IM programs, but not on Yahoo! Messenger 10, this fix should take care of the issue. - If your video call button is grayed-out when you're IM'ing with a friend, it's because they're on an older version of Yahoo! Messenger. In order to receive your video call, they also need to upgrade to Yahoo! Messenger 10 Beta. To help reduce confusion about this, we added an inline message explaining this. - When you make a call to a friend but they don't answer within 20 seconds, the call is automatically terminated. Previously there was no messaging about this, so we added one to let you know that your friend did not answer your call. - In the event your internet connection can no longer support the full video call (e.g. video + voice), the conversation gets downgraded to a voice-only call. When this happens, the video picture disappears. This is the correct behavior, but we added some inline messaging so you'll know when and why it's happening.